Balancing a rowing shell – a very long, very narrow vessel only a couple of inches off the water – is like going backwards on a fast-moving skateboard with only one wheel. Balance is helped, however, by the 10-foot oars on each side, along with an almost infinite number of other variables. The basic building blocks of balance are body position, core strength, and hand control. If your concentration is off for a second, you lose balance and stabilization and the boat flops and slows down. Most workers today also find themselves in similar balancing acts: They’re juggling large numbers of variables, including work, family, travel, school, and all the other things today’s workforce is expected to manage. The modern worker is expected to take on more and more responsibilities, and if any one of these responsibilities is thrown off, the others may follow suit, decreasing productivity. Hence, balance is as critical for workers as it is for rowers. 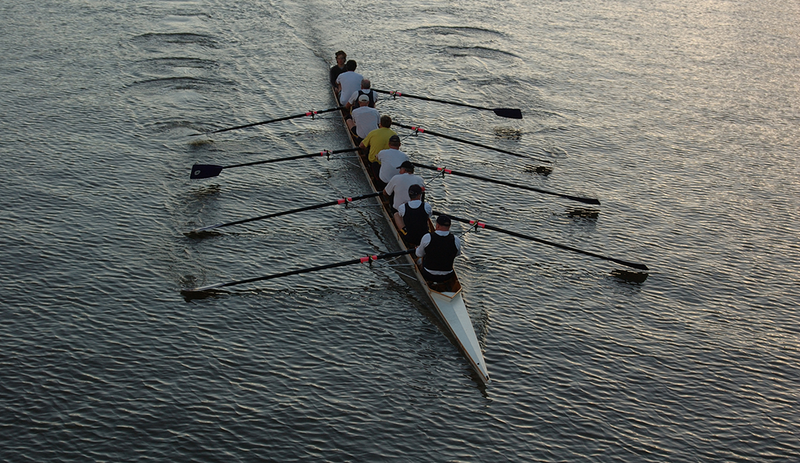 In rowing, the foundation to success is the basic sequence of body movement. In your work and personal life, the basic building blocks are the calendar, scheduling, and planning. Scheduling time for yourself and your health along with everyday work appointments is key to keeping that balance. After the foundation is built, fine details can be connected to supply extra stability. For instance, even the smallest body parts moving at just the right moment can have a profound effect on boat balance. Details are crucial to supporting better balance in your day-to-day as well. Schedule time between appointments for prep and follow up, for strategic planning and thinking, and for team encouragement. Prioritizing these small but important tasks can have a positive effect on productivity. With lots of moving parts and outside factors like wind, current, other crews, and steering, prioritization becomes, well, a priority. In other words, you have to get the work done. It’s human nature to feel overwhelmed by emails, voicemails, texts, and last-minute deadlines. Prioritization is key here, too: when the going gets tough, you need to focus on what needs to be achieved and what is necessary to be productive. One of the most important elements to keeping a boat moving fast and balanced is the timing of your stroke. Dedicating focus on this main factor is critical to both balance and boat speed. I once had a manager that told me, “Five minutes early is 10 minutes late.” I love that expression because it encourages planning ahead and being on time. Being late is unprofessional, and your lateness can have a domino effect on the rest of your day’s meetings, tasks, and obligations. While rowing, if your oar hits a small branch in the river, you could end up in the water upside down – unless you’re following the above tactics. If you’re prepared for whatever comes your way, it’s much easier to overcome the unpredictable. There are infinite ways that life won’t go as planned, and many of the determining factors are outside your control. Preparedness – whether through prioritization or by paying attention to the details – is the only way to overcome unexpected obstacles gracefully. Gliding along in a well-balanced rowing shell at maximum speed can be one of the most exhilarating experiences for an athlete. The simplicity and smoothness of the motion makes it all look easy from afar, but the dynamics underneath the effort are amazingly complex. Similarly, the ideal worker appears always to be in control, balanced, and on time, but of course that is only because the worker has mastered the difficult dynamics beneath it all. Productivity is the measuring point of success for balance in both rowing and work. While productivity in a boat equals boat speed, productivity at work can lead to a quicker promotion or raise. The five tactics outlined above should help you with either effort. 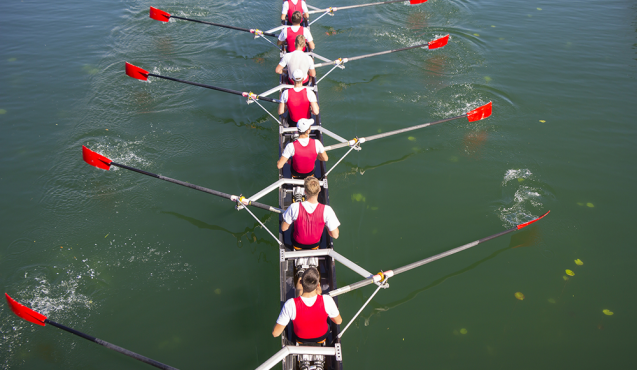 Jeff Nelson is the business engagement manager of Community Rowing Inc., a nonprofit rowing organization that excels in offering team-building and executive training programs to help companies find their swing.